Air distribution system performance is critical to achieving displacement cooling. This requires that air be delivered directly out of the coolers to the work floor in volumes and at velocities to flood the work area with unmixed air. 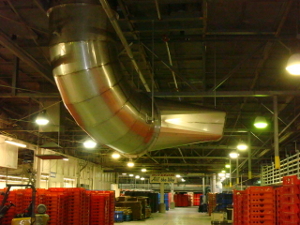 Then the air must wash over heat sources and exit the facility via exhaust fans or dampers. This requires careful layout of the coolers and exhaust fans and use of long throw diffuser ducts. 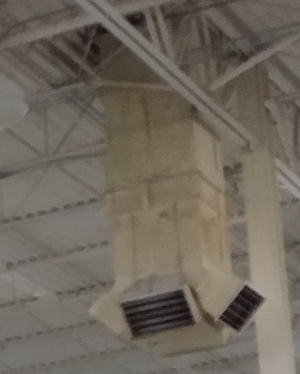 If the distribution ducting in your facility has the typical duct registers found in office spaces as shown in the adjacent figure you cannot achieve displacement cooling. This is because the registers are designed to limit the throw length and promote air mixing in refrigerant air conditioning systems to avoid having cold (less than 55 F) air blow unmixed directly onto workers. 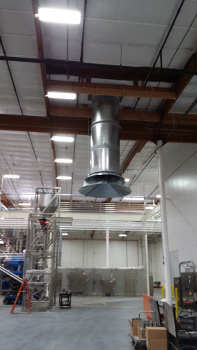 In evaporative cooled systems we want the air to blow directly over workers when the discharge air is greater than 65 F. When discharge air is cooler than 70 F the system controls are used to reduce the volume flow rate to reduce the throw distance and allow some mixing. Achieving displacement cooling in industrial buildings is challenging but attainable as demonstrated in a number of commercial installations. It is challenging in that the facilities typically involve large floor spaces with mobile, fixed, or portable process equipment or other components that interrupt air distribution paths. Further the distance from the work floor to the roof or ceiling is large with requirements to keep the height of the work area envelop 13 feet or more. These requirements dictate long throw distance and large area pattern capabilities in the selected diffusers. AZEVAP has area and directed duct diffusers that have demonstrated ability to satisfy these requirements. 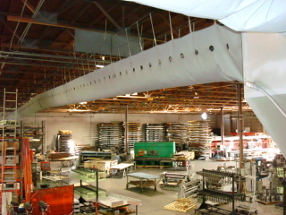 AZEVAP also uses Fabricair� orifice and jet duct where its application offers the best solution. 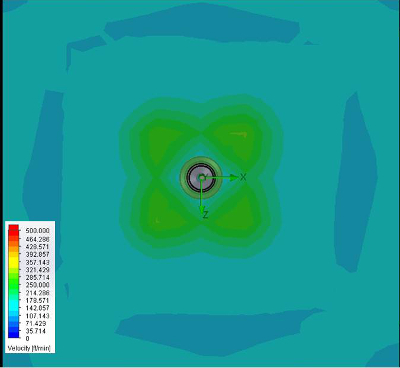 The velocity plots below for a 48,000 cfm vertical discharge duct are a representative sample of analysis performed to verify the design of ducting for industrial applications. 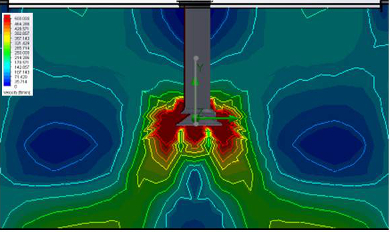 Computational Fluid Dynamic (CFD) models of the components and facility performance with field confirmation of model predictions for both throw distance and coverage provide confidence in being able to achieve and bring the benefits of displacement cooling in industrial facilities. AZEVAP has confirmed that air distribuiton that supports displacement cooling can be achieved at industrial facilities and that the benefits of displacement cooling are as significant as expected.